Basecamp Classic: How does the privacy setting work in Basecamp? 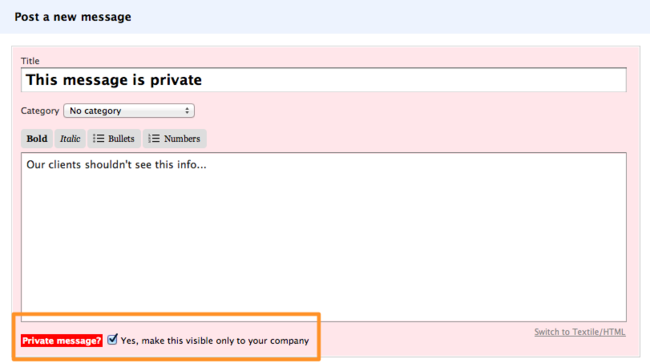 Private items can be seen by members of your primary Basecamp company but can NOT be viewed by people in your client companies. Account owners & admins can make files, messages, and to-do lists private. Milestones & events cannot be made private. Clients will see no reference to the private items. They won’t receive any email notifications related to private items. This allows you to share sensitive or not-yet-finalized information internally without needing to worry about clients accessing these entries. Private items are called out with a small red “PRIVATE” item badge in the upper right corner of the item. They are highlighted in red on your Dashboard & Overview pages. You can enable privacy for messages, files, and to-do lists when you are creating them. You can update this setting later, by clicking the ‘Edit’ link near that item. Privacy settings are inherited. This means a file attached to a comment on a private to-do list will also be private.